Since today is April Fool’s Day – and my birthday – pour a glass of something cheerful, and let’s celebrate together by admiring James Tissot’s most joyful images. Tissot’s paintings are notable for their psychological ambiguity or tension – moodiness, quarrels, shady situations, vulgarity, frustration, even anger. But a handful portray sheer happiness, and we all need a dose of that, especially in the uneven weather of spring! In Partie Carée – exhibited at the 1870 Salon, the cautious, business-minded Tissot was at his most devil-may-care. These convivial friends are certainly delighted to spend time together at their leisurely, riverside Happy Hour! One of the most lovely images Tissot ever created, The Bunch of Lilacs (c. 1875) is set in the new conservatory in Tissot’s St. John’s Wood house at 17 (now 44) Grove End Road. The peace, profusion and prosperity in this painting just make me smile: this woman doesn’t seem to have a care in the world as she waltzes over the gleaming floor. Can’t you just hear her humming some pretty tune? You can’t help but feel part of A Fête Day at Brighton: it’s a street party at a seaside resort, and you can feel the uneven pavement under your feet, the sun on your face, and the exhilarating breeze in your hair. Tissot painted members of the famous I Zingari cricket club (which still exists, and is one of the oldest amateur cricket clubs) in their distinctive black, red and gold caps in his garden at 17 Grove End Road, St. John’s Wood, which was only a few hundred yards from Lord’s cricket ground. Holyday was exhibited at the Grosvenor Gallery in London from May to June, 1877. Oscar Wilde, then a 23-year-old student at Magdalen College, Oxford, reviewed the Grosvenor’s exhibition in Dublin University Magazine that summer, skewering the subject matter of Holyday as “Mr. Tissot’s over-dressed, common-looking people, and ugly, painfully accurate representation of modern soda water bottles.” No doubt Oscar would find me quite common, since I find this image entirely merry! I want to join this lively group for a cup of tea and a slice of cake. Holyday is on display at Tate Britain in room 1840; click here for an interactive look at it. October (1877) depicts Tissot’s mistress and muse, Kathleen Newton (1854–1882) in the full bloom of beauty at age 23, glowing amid the fall foliage. I saw this when I was in Montreal, and you can almost hear Mrs. Newton’s petticoats rustling over her kitten heels. Tissot presents her youthful charm in such a surprisingly intimate close-up composition for a monumental painting – over 7 feet tall and 3 ½ feet wide – that it overwhelms the viewer with a sense of vitality. Tissot’s garden, the setting for In an English Garden, was designed with a blend of English-style flower beds as well as plantings familiar to him from French parks. Gravel paths led to kitchen gardens and greenhouses for flowers, fruit and vegetables. This painting shows Tissot’s ornamental pond from a different viewpoint than Holyday. It portrays a gorgeous day in a gorgeous garden, the figures enjoying blissful privacy and serenity. Le Petit Nemrod (A Little Nimrod, c. 1882) depicts cousins, the children of Mrs. Newton and her sister Polly Hervey, playing together in a London park. (Nimrod, according to the Book of Genesis, was a great-grandson of Noah, and he is depicted in the Hebrew Bible as a mighty hunter.) Can’t you hear these kids giggling and shrieking? Sur la Tamise/On the Thames (The Return from Henley, c. 1884-85) is a flight of fancy radiating girlish euphoria. That this tightly-swaddled creature managed to seat herself in this skiff, and to stand upright again, is explicable only by one word: magic. 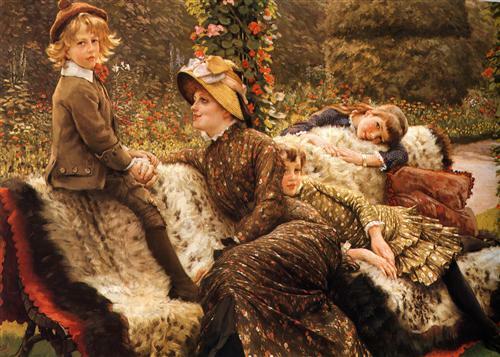 Le banc de jardin/The Garden Bench (c. 1882) was a favorite image of Tissot’s; he kept it all his life. Pictured are Kathleen Newton, her daughter Violet, her son Cecil George, and a second girl who could be her niece Lilian Hervey or her niece Belle (behind the bench). Sheer maternal joy. So – a toast to lovers of James Tissot around the world: Cheers, my dears! Was James Tissot a Plagiarist? © 2016 Lucy Paquette. All rights reserved. This entry was posted in Art blog, Art History, Impressionists and tagged James Tissot, Kathleen Newton on April 1, 2016 by Lucy Paquette, author of The Hammock: A novel based on the true story of French painter James Tissot. Love them all — but the Lilacs and October paintings are my favorites! Thanks, Mimi! I love that confident little dog, too, as well as the relaxed “vacation” expression on the woman’s face. Just an upbeat image, all in all!